SGT Paul Rogers, a graduate of the third ASTC training class. New Guinea, 1944. 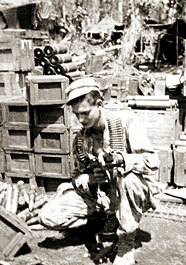 Paul Rogers at an ammo dump reloading his Thompson machine gun. New Guinea, 1944. 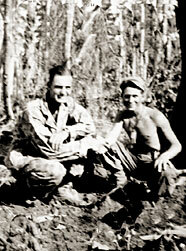 Alamo Scout Paul Rogers (left) relaxes with his good friend, Redd Stewart, somewhere near Maffin Bay, New Guinea, 1944. 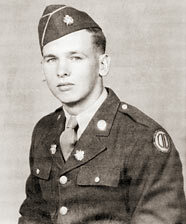 Earlier that year, Stewart wrote the #1 hit song "Soldier's Last Letter," performed by country music great Ernest Tubbs. After the war Stewart and Pee Wee King co-wrote the blockbuster hit song "The Tennessee Waltz," and Stewart went on to enjoy a noted career in country music. 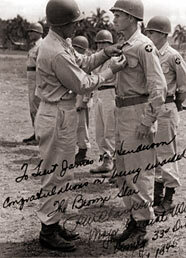 James N. Henderson, a graduate of the 5th Alamo Scout training class, receives the Bronze Star for valor in early 1945 while serving with the 33rd Infantry Division on Luzon. Note the inscription by MG Clarkson. 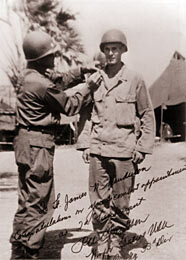 SSG James N. Henderson is commissioned a 2nd Lieutenant with the 33rd Infantry Division in March 1945. Henderson is one of several men trained at the ASTCs who were awarded battlefield commissions. 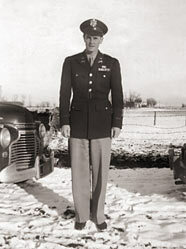 First Lieutenant James N. Henderson back home in Illinois upon discharge from the Army. December 1945. 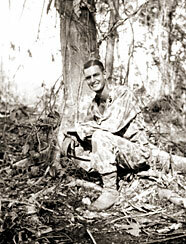 William E. McCommons pictured in Japan during occupation duty with the Alamo Scouts. 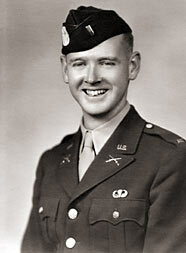 McCommons was a graduate of the last training class and was a member of Adkins Team, which performed the initial reconnaissance of Wakayama Beach upon the Allied landing there in September 1945. 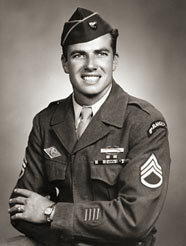 Prior to joining the Alamo Scouts, McCommons was a member of CO F, 136th Infantry, 33rd Infantry Division, 6th Army, where he received a Purple Heart, two Bronze Stars and two Presidential Unit Citations. 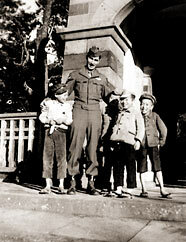 Alamo Scout William E. McCommons enjoys a light moment with Japanese children during occupation duty with the Alamo Scouts in September 1945. 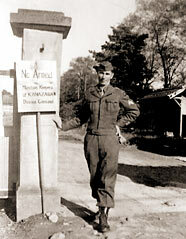 McCommons' duties upon arrival in Japan included scouting for arsenals and collection and destruction of weapons caches. 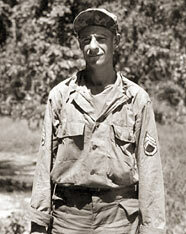 Lieutenant William Nellist following graduation from the Airborne School at Fort Benning, GA. 1943. 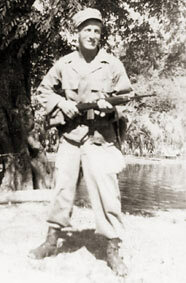 Before joining the Alamo Scouts and becoming a team leader, Nellist served for one year as an instructor at the Airborne School. Lieutenant Woodrow Hobbs. Hobbs was a graduate of the second Alamo Scouts Training Class and led several missions in New Guinea and in the Philippines. Newly promoted Staff Sergeant Peter Macfarlane in dress uniform in Brewster, NY. November 1945. Sgt. 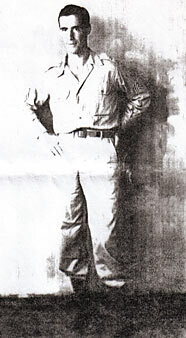 Peter Macfarlane poses for a photo in Manila two weeks after graduating from the Alamo Scouts Training Center. July 1945. 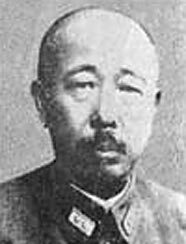 General Tomoyuki Yamashita (1885-1946). 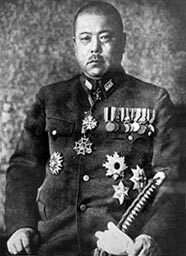 Known as the "Tiger of Malaya," for his ruthlessness, Yamashita was commander of all Japanese forces in the Philippines. Several Alamo Scout teams (DERR, VICKERY, ROUNSAVILLE, NELLIST, and SHIRKEY), combed the mountains of northern Luzon from January 1945 until the end of the war looking to kill or capture the notorious general. Yamashita surrendered to US Forces on 2 September 1945 and was hanged for war crimes in 1946. 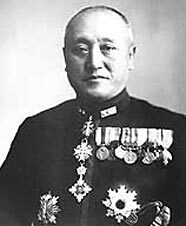 Vice-Admiral Nobutake Kondo, commander of the Southern Fleet of the Japanese Imperial Navy. Kondo was the overall commander of amphibious operations in the Philippines in 1942, and took part in operations at Malaya, Sumatra, Java, Guadalcanal, Midway and Savo Island. 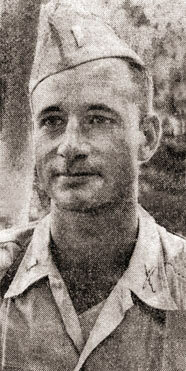 Acting on reports from Filipino Guerrillas in May 1945, SUMNER TEAM pursued Kondo throughout the Zambales Mountains on Luzon in hopes of an attempted capture, but the team was unable to locate the elusive admiral. That month, Kondo was appointed to the Japanese Supreme War Council. General Hatazo Adachi, commander of the Japanese 18th Army in New Guinea. Adachi commanded the invasion of Aitape and fought a bitter delaying action against Allied forces in New Guinea. Many of the Alamo Scouts missions from April-September 1944 consisted of collecting and supplying information on the 18th Army to Sixth Army. 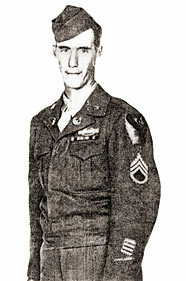 In late June-early July 1944, several teams of Alamo Scouts planned a mission to capture Adachi and his senior staff near Wewak, but General Krueger vetoed the mission at the last minute stating, "I wouldn't take the whole Jap Army for one Alamo Scout." Adachi committed hari kari after the war due to the shame he felt over losing 100,000 troops under his command. (Photos courtesy of Professor Kuzuhara, National Defense Academy of Japan).